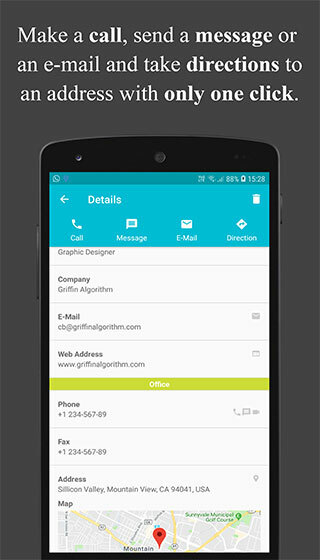 Scan, create and share business cards with only one app. 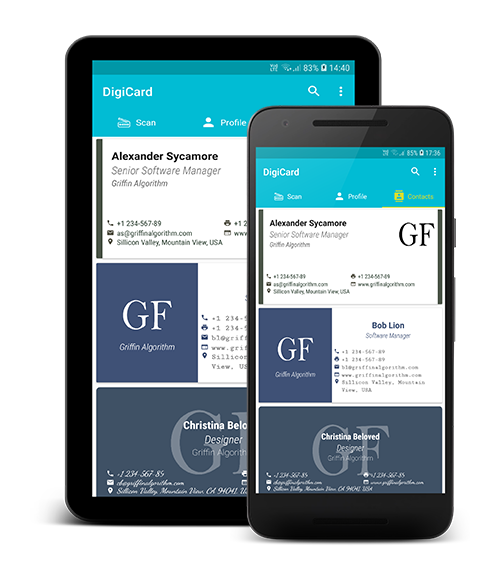 DigiCard is an eco-friendly business card application which can be used on phones and tablets. It can scan your printed business cards and save personal information automatically. Therefore, you can get rid of keeping your cards and recycle them. 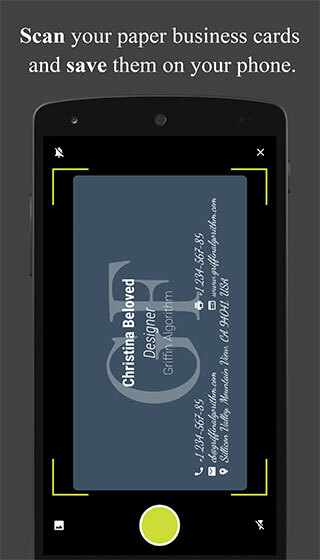 Without printing, you can share digital cards which you design on your phone or tablet. 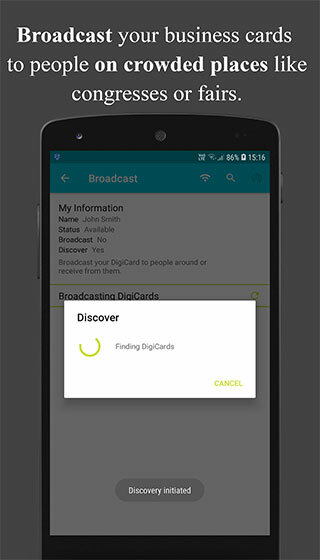 You can make calls, send messages or e-mails and take directions to addresses using cards you saved. Scan your visitor cards and save them to your phone or tablet. Choose a card design, change colors and fonts as you desire. Exchange your cards easily with NFC, Bluetooth or WiFi. Send your cards to people, even they do not have DigiCard. Make your business card publicly reachable using WiFi and broadcast it to people on crowded places like congresses or fairs. 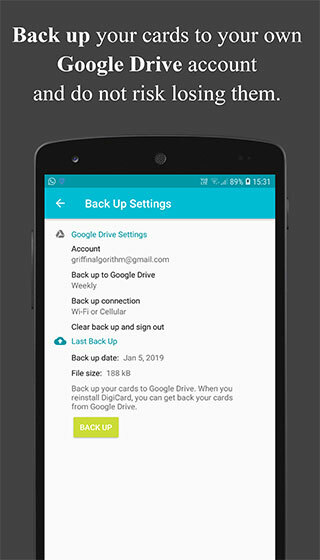 Back up your cards to your own Google Drive account and do not risk losing them. Export your cards as a vCard or csv file for MS Excel, MS Outlook or Google Contacts. Load your contacts to Google Contacts. Scan your visitor cards and save them to your phone or tablet. 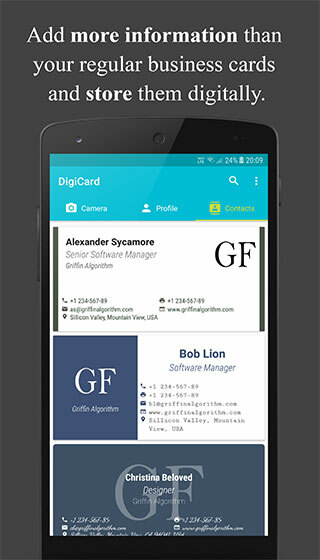 DigiCard is a smart business card app holds your visiting cards. 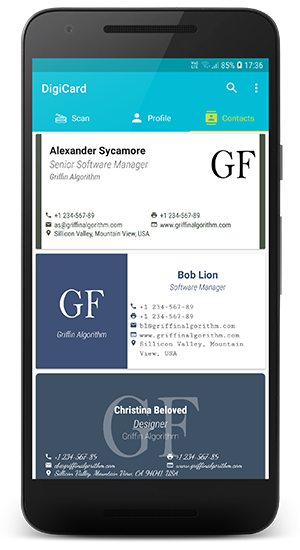 Create your own business card on your phone or tablet, choose a card design, change colors and fonts as you desire. You can save your contact information as a vCard file (.vcf). When you save your cards, you can also save them to device contacts list automatically. Search cards easily according to name, company, profession, etc. Make a call, send a message or e-mail and take direction to an address with only one click. 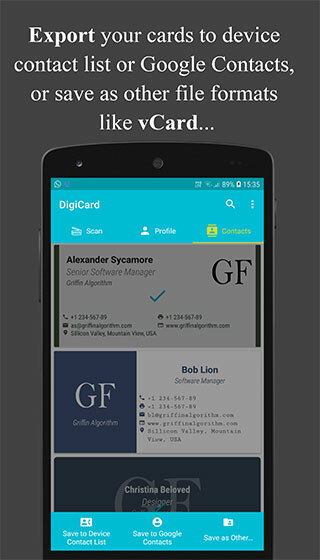 Share your cards by using your favorite messaging apps.Send your card as a vCard and xdgc. Get start your business with our awesome pricing plan. Create a bussiness card for yourself. Share your cards freely by your messaging apps. Export your contacts as a vCard. Create 5 different bussiness card for yourself. 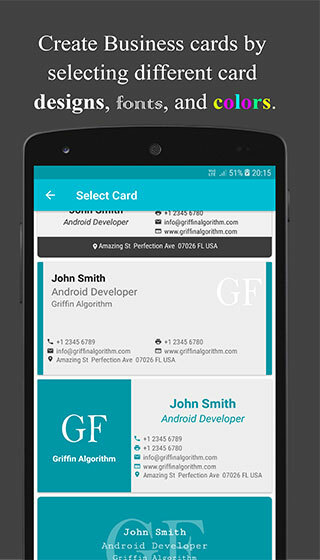 Create your cards by choosing different design, colors and fonts. Scan unlimited number of cards. Save unlimited number of cards. Exchange cards using Wifi, Bluetooth or NFC. 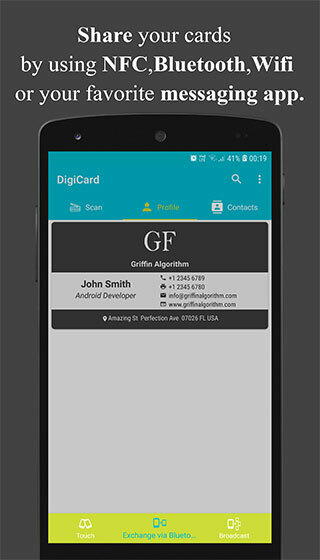 Save all your cards to device contact list. Export your contacts as vCard,csv file or any other file formats. Back up your cards to your own Google Drive account. Available on Google Play Store and coming soon on App Store.